Telkonet developed the EcoSmart platform, an energy management system that responds intelligently to energy usage and preferences. Initially educating reseller partners through face-to-face sessions, Telkonet needed to scale product training delivery so they could grow their revenue and support their fast-growing partner base. They turned to LearnUpon's powerful learning management system to deliver, manage and track their training. With LearnUpon’s support, Telkonet has built a sustainable product training program delivered through their online university. It ensures their partners are fully qualified to sell, install and use their products and has resulted in a significant reduction in support queries. “When our partners complete online training prior to installing our products, support requirements are reduced by 90%. That means only 1 out of every 10 sites requires additional installation support when online training has been completed." Telkonet wanted to grow their reseller business while maintaining high partner standards. But two things stood in their way. Firstly, training partners face-to-face, with tutorials built in Articulate Storyline, was no longer sustainable. Secondly, they had no visibility on how their training was performing. A new way of delivering training that met their needs would ensure their product training produced qualified partners. This, in turn, would protect their reputation by helping their partners deliver excellent service to the end users of their products. With no formal online training strategy in place, Telkonet decided to do some research. After investigating multiple systems, they discovered LearnUpon’s learning management system would improve the training experience for their staff and partners. It provided them with what they needed to grow their partner business. Telkonet is reaping the benefits of using LearnUpon LMS to deliver partner training. A positive experience for the business, it enables them to deliver a more enriched training experience. Their support requirements have been reduced by 90%. 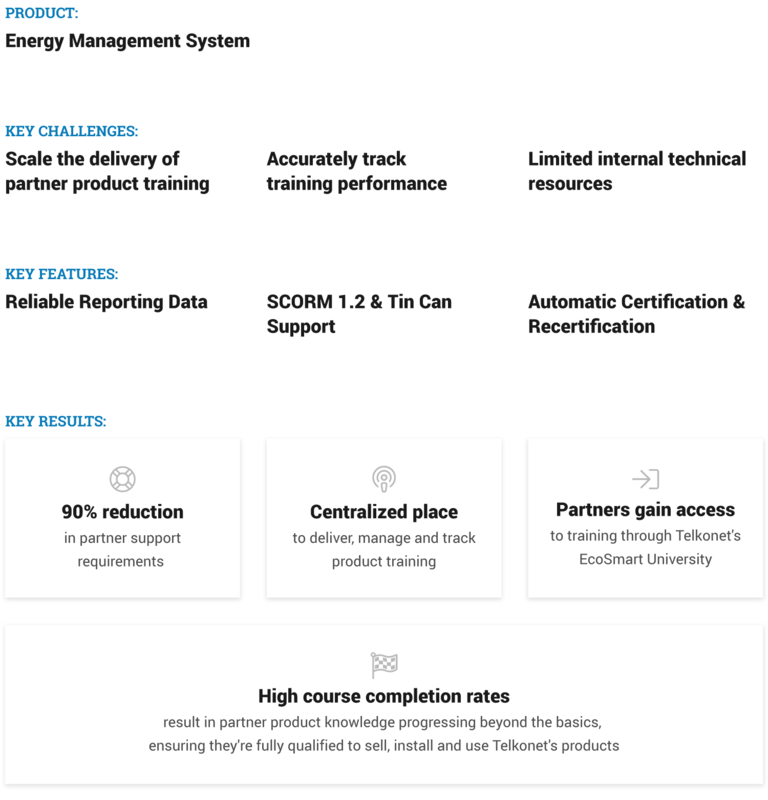 And by incentivizing partners to complete training through their EcoSmart University, they’ve increased course completion rates and progressed their partners’ product knowledge beyond the basics. "Face-to-face training is enhanced because of the training partners complete online before live sessions. Partners are able to ask more informed questions, and they're able to discuss topics more in-depth because they've already covered all of the basics." Access to training data allows them to track if their partners are qualified to sell, install and use their products. If there’s an issue with an engineer during an installation, they can quickly check the LMS to see if that partner has completed the necessary training and identify if additional training is required. Telkonet use surveys to gather invaluable feedback from partners that enables them to continuously improve training. Partners tell them what they’re doing right and what they could be doing better. Using LearnUpon’s course re-versioning and licensing functionality they quickly update and improve their courses to get even better results. Telkonet consistently hear that their partners find the courses easy to navigate - an important element that removes barriers to accessing training and ensures partners complete courses - on desktop or on the move, via mobile device. The business’s training and marketing departments also discovered how delivering certified partner training supports them. It builds and protects their brand. Partners are educated on how to present and talk about products so they’re aligned with Telkonet’s brand values and vision. Telkonet is constantly impressed with the level of support they receive from LearnUpon’s Customer Support team and their dedicated Customer Success Specialist. Any queries they raise are resolved quickly and they have access to a knowledgeable, experienced team to guide them whenever they need it. The success of their partner training program has inspired Telkonet to expand their training efforts to their employees and customers. Training delivered to their sales and support teams will keep their product knowledge up-to-date. While training delivered to their customers will keep them happy, engaged, and experiencing the benefits of Telkonet’s products.